MARS SCIENCE LABORATORY - FINALLY SOME HONESTY? Martian sands blow around too much. Will MSL say why? On Saturday, November 26, 2011, I walked out behind my apartment in Daytona Beach Shores, Florida, and watched the Mars Science Laboratory blast off for Mars. 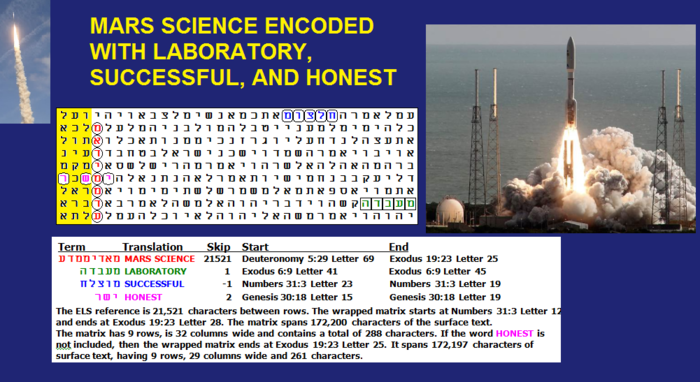 After the Sabbath I checked the Codes to see if the mission is encoded with success or falure. The practical limit of axis terms at an ELS is usually 8 to 10 letters. 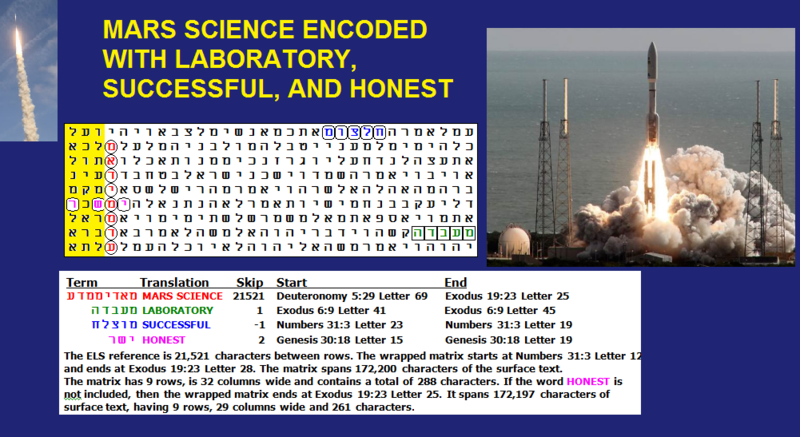 To write Mars Science Laboratory in Hebrew, as found on-line, requires 5 letters for Mars, 3 for Science, and 5 more for Laboratory, a total of 13 letters. In 14 years of Code research, I never found an axis term that long. Therefore, to search for this term I sought MARS SCIENCE as the axis term, and LABORATORY as the first a-priori key word. As is shown on the matrix below, LABORATORY is at skip +1, the best possible scenario for a key word, though the axis term is only at its 4th lowest ELS. I then sought synonyms for the words SUCCESSFUL (found at skip -1, a special case skip) and FAILURE (not on the matrix). Finally, because I had a question about whether this mission would produce honest or dishonest results given past claims about low Martian air pressure (disputed by my son and I at this year's Mars Society Convention), I sought words for honest and dishonest. There were no special case skips found for either word, with the best ELS at skip +2 for HONEST, but to show it required expansion of the matrix from 260 letters to 288 letters. STATISTICAL SIGNFICANCE OF THE MATRIX. There is only one occurence at skip +1 of the 5-letter word for LABORATORY in Torah. Odds against it being this close to MARS SCIENCE were about 1,168 to 1. Odds against having one of two synonyms checked for SUCCESSFUL at a special case skip (here -1, but +1, or the absolute skip of the axis term would have worked too) were about 234 to 1. Odds against having both these words encoded in this fashion with MARS SCIENCE by the 4th lowest ELS of MARS SCIENCE were about 68,367 to 1.The matrix is thus deemed highly signigficant. LEARNING THE TRUTH ABOUT MARS. Unlike the apparently ill-fated Russian Phobos Grunt mission that failed to leave Earth orbit (at least as of November 27, 2011), there is no significant match between the MSL and the word SABOTAGE. While, until September, 2011, I had serious questions abot whether the low pressures reported for Mars by the Jet Propulsion Laboratory were due to incompetance or delilberate disinformation, the recent releases about Mars having 10 to 100 times for water vapor than previously believed, plus rapidly moving sand dunes, and even sand quickly blowing in to fill the tracks of recent rovers offers hope that the previous low pressure assertions can be linked in faulty pressure transducer design and data interpretation. Most of those who staked their careers on the low pressures, are now either deceased, retired, or very near retirement. While concerned by the fact that MSL's Curiosity Rover carries the same transducer that we believe failed due to dust clots in the air access tube on landing, at least we have reason to hope that this mission will yield more accurate (and hopefully honest) results. Let's explore tHe two recent findings that give me confidence that JPL was wring in the past, and on the right path now. 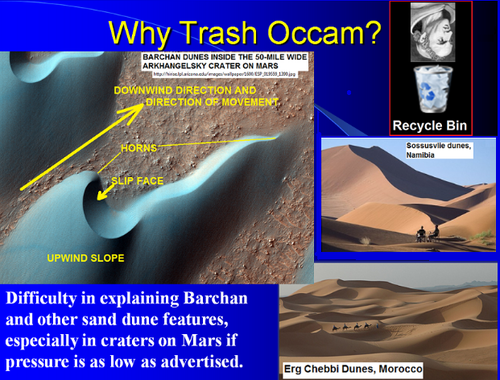 THE ISSUE OF MARTIAN WINDS AND MOVING SANDS: On one my son's slides (shown below), after presenting data about how our earlier landers failed to correctly measure air pressure on Mars, he refered to Occam’s Razor which states that (1) entities must not be multiplied beyond necessity and (2) the simplest solution is usually the correct one. The slide 43 was included because it looks like the sand has move around much more on Mars than it should for a planet that is only supposed to have an average air pressure of 6.1 mbar at areoid compared to 1,013.25 mbar on Earth. This slide was shown at the Mars Society Convention in Dayton, Ohio in 2010, but it was left as a spare slide (#57) in his presentation at the convention in Dallas in 2011. This summer we though that the topic needed more proof. That proof was released by the Jet Propulsion Lab on November 17, 2011. It is quoted, word for word, below the slide. 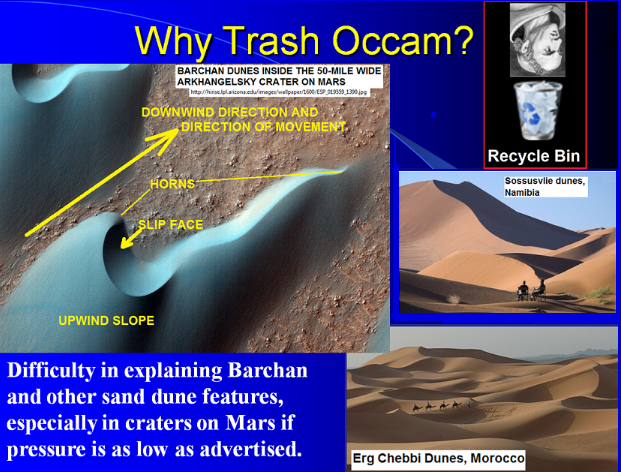 There is also a film clip at http://www.nasa.gov/mission_pages/MRO/main/index.html that shows dune Martian movement. More, there is new evidence of liquid water movement across the current Martian surface at http://www.nasa.gov/multimedia/videogallery/index.html?collection_id=14659&media_id=104892521. WASHINGTON -- Images from NASA's Mars Reconnaissance Orbiter (MRO) show sand dunes and ripples moving across the surface of Mars at dozens of locations and shifting up to several yards. These observations reveal the planet's sandy surface is more dynamic than previously thought. "Mars either has more gusts of wind than we knew about before, or the winds are capable of transporting more sand," said Nathan Bridges, planetary scientist at the Johns Hopkins University's Applied Physics Laboratory in Laurel, Md., and lead author of a paper on the finding published online in the journal Geology (This writer's note: winds can only be more capable of transporting sand if the air is denser than believed). "We used to think of the sand on Mars as relatively immobile, so these new observations are changing our whole perspective." While red dust is known to swirl all around Mars in storms and dust devils, the planet's dark sand grains are larger and harder to move. Less than a decade ago, scientists thought the dunes and ripples on Mars either did not budge or moved too slowly for detection. MRO was launched in 2005. Initial images from the spacecraft's High Resolution Imaging Science Experiment (HiRISE) camera documented only a few cases of shifting sand dunes and ripples, collectively called bedforms. Now, after years of monitoring the martian surface, the spacecraft has documented movements of a few yards or meters per year in dozens of locations across the planet. The air on Mars is thin, so stronger gusts of wind are needed to push a grain of sand. Wind-tunnel experiments have shown that a patch of sand would take winds of about 80 mph to move on Mars compared with only 10 mph on Earth. Measurements from the meteorology experiments on NASA's Viking landers in the 1970s and early 1980s, in addition to climate models, showed such winds should be rare on Mars. The first hints that Martian dunes move came from NASA's Mars Global Surveyor, which operated from 1997 to 2006. But the spacecraft's cameras lacked the resolution to definitively detect the changes. NASA's Mars Exploration Rovers also detected hints of shifting sand when they touched down on the red planet's surface in 2004. The mission team was surprised to see grains of sand dotting the rovers' solar panels. They also witnessed the rovers' track marks filling in with sand. "Sand moves by hopping from place to place," said Matthew Golombek, a co-author of the new paper and a member of the Mars Exploration Rover and MRO teams at NASA's Jet Propulsion Laboratory in Pasadena, Calif.
Not all of the sand on Mars is blowing in the wind. The study also identifies several areas where the bedforms did not move. "The sand dunes where we didn't see movement today could have larger grains, or perhaps their surface layers are cemented together," said Bridges, who also is a member of the HiRISE team. "These studies show the benefit of long-term monitoring at high resolution." According to scientists, the seemingly stationary areas might move on much larger time scales, triggered by climate cycles on Mars that last tens of thousands of years. The tilt of Mars' axis relative to its orbital plane can vary dramatically. This, combined with the oval shape of Mars' orbit, can cause extreme changes in the Martian climate, much greater than those experienced on Earth. Mars may once have been warm enough that the carbon dioxide now frozen in the polar ice caps could have been free to form a thicker atmosphere, leading to stronger winds capable of transporting sand. HiRISE is operated by the University of Arizona in Tucson. The instrument was built by Ball Aerospace & Technologies Corp. of Boulder, Colo. The Mars Exploration Rovers Opportunity and Spirit were built by JPL. JPL also manages the MRO and Mars Exploration Rover projects for NASA's Science Mission Directorate in Washington. Lockheed Martin Space Systems of Denver is NASA's industry partner for the MRO Project and built the spacecraft. THE ISSUE OF EXCESS WATER VAPOR IN THE MARTIAN ATMOSPHERE: The following article was found at http://sci.esa.int/science-e/www/object/index.cfm?fobjectid=49342. 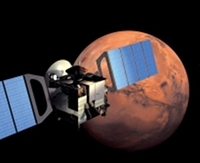 ESA orbiter discovers water supersaturation in the Martian atmosphere.